My cousin Lisa had photocopied some pictures of our grandparents to share with us and I have had this picture for sometime and knew I wanted to scrap it. I did scan the one she gave me and then printed on photo paper. I kept trying to think of how I wanted to scrap the picture because I wanted it to be something special, after all my grandma was very special *okie knows everyone always thinks they have the best grandma in the world but okie knows hers was really the best*. I didn't get to see my grandma much growing up as she lived in West Virginia and our trips there were few and far between. My cousins and I talk about how grandma had a way of always making all her grand kids feel they were all loved just the same even if she didn't always get to see them. Anyway I knew I would need the "just right" items to really make this special picture be something fabulous. I always kept an eye out for something but never was able to find what I felt I needed. My friend Carmen, aka ScrapperDelighted, called me all excited this summer about a deal Websters Pages was having. You could get a box of different items for $25. She ordered 3, one for me, one for her and one for another friend. When I went to Houston to see her I got to open my box and I knew immediately I was going to use the product on some older photos I had and especially this picture of my Grandma. I printed two pictures at 4x6 of my grandma and then trimmed one smaller than the other. I added some chipboard behind the top layer to give it some strength so it would hold up and then pop dotted and placed it over the bottom image. I did this because the picture quality was not very good and I didn't want the picture to get lost in the elements of the page. The Monarch butterflies were printed from my computer. I found an image I liked on the internet printed it 3 times from my photo program. I layered two of the images, which you probably really can't tell in the picture, and used brads to keep the images together and used small squares of mounting foam between the wings. 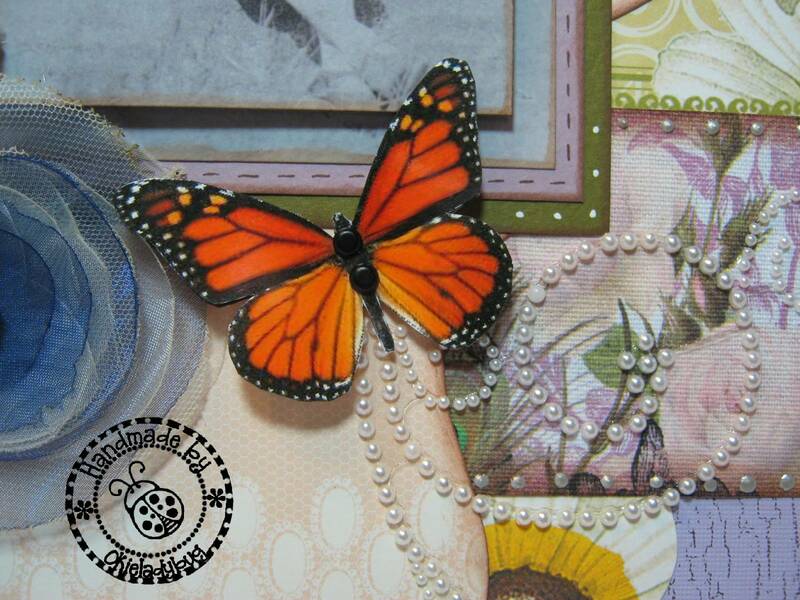 The pearls were placed as to make it look like that butterfly was in flight. GERTIE was cut using Storybook. I used some Mica Stardream Cardstock in copper and brown. I need colors that were going to stand out since there were so many colors in the papers I thought the darker colors would work better. I added the Liquid Pearls after placing the letters on the layout. I have to say this really goes beyond what I am usually comfortable doing since it is a really heavily embellished and busy layout but I do like how it turned out! A stunningly BEAUTIFUL layout, Okie! I just wanted to set the record straigh, though! MY Grandmother, Mom, was the single best Grandma in the WORLD! ;) Seriously, she was an amazing woman and I got the creative talent I have from her! Thanks for sharing about your Grandma and giving me a chance to tell you I had an amazing one as well! What a great tribute to your grandma. You combined so many elements will a balanced effect. 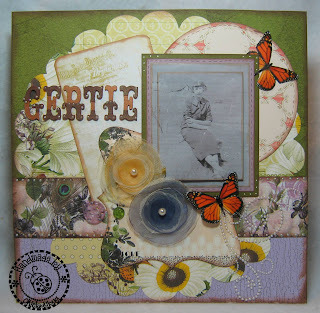 This is just a beautiful LO - and the picture of your grandmother does really stand out! You got it just right! Absolutely beautiful LO! You always do a great job on your projects. You need to get out of your comfort zone more often. Grandmas really are the best. Great layout with tons of detail. 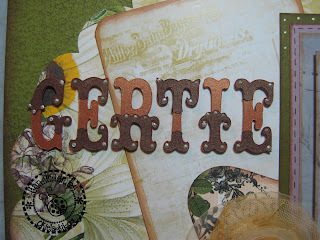 Ahh your grandma's name is Gertie so sweet. LOfe the page. This is so beautiful!! 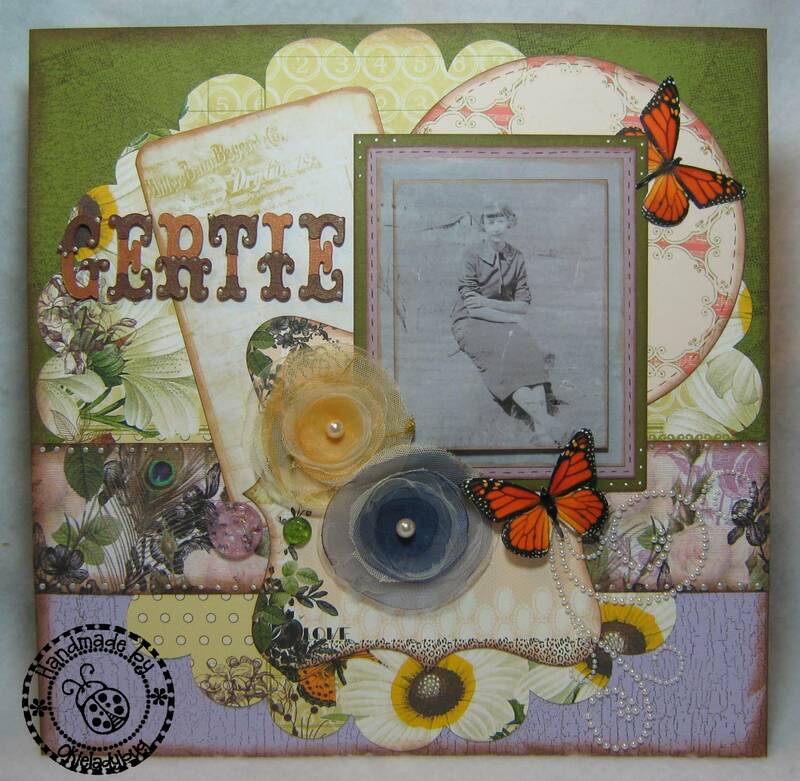 Your grandma Gertie would be very proud! lovely tribute to your grandmother. I have a photo of my great grandmother and father and have been looking for just the right papers for them as well.